are termed the electron diamagnetic velocity and the ion diamagnetic velocity, respectively. Thus, the MHD ordering can be regarded as a strong electric field ordering, whereas the drift ordering corresponds to a weak electric field ordering. generally acts to reduce the magnitude of the magnetic field inside the plasma. There is no unbalanced particle flux in the -direction, because the -directed fluxes are associated with electrons that originate from regions where . We have now accounted for the first term on the right-hand side of Equation (4.234). We can account for the second term using similar arguments. The ion diamagnetic velocity is similar in magnitude to the electron diamagnetic velocity, but is oppositely directed, because ions gyrate in the opposite direction to electrons. 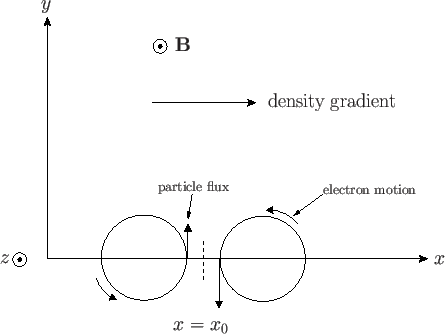 Figure 4.3: Origin of the diamagnetic velocity in a magnetized plasma. The most curious aspect of diamagnetic flows is that they represent fluid flows for which there is no corresponding motion of the particle guiding centers. Nevertheless, the diamagnetic velocities are real fluid velocities, and the associated diamagnetic current is a real current. For instance, the diamagnetic current contributes to force balance inside the plasma, and also gives rise to ohmic heating.